An informational blog for the Thomas Jefferson Elementary School community. We are a PROUD Roseville City District school and the home of the RISING STARS! Happy Friday Thomas Jefferson Families!!!! My apologies for not updating the Blog last week, it was a super busy week filled with FUN! Thank you so much for coming out to StarStruck! What a show and thanks for being such an amazing audience! There is nothing better than watching our STARS shine. It is a pleasure to watch them SHINE in the classroom and on the stage! If you are still interested in purchasing a DVD of the show please stop by the office! Thank you so much for those who were able to make it to Denim and Diamonds! It was a HUGE success with over $5000 raised for our stars! As we end our school year we have MUCH to do and we are going to continue to provide quality instruction while having FUN! We will be discussing the ELL program at Thomas Jefferson, School Attendance and seeking parent input. THERE WILL BE AN EARLY RELEASE DAY ON Thursday, APRIL 11 DUE TO OPEN HOUSE. PLEASE NOTE THAT ALL KINDERGARTEN CLASSES WILL COME TO SCHOOL AT 8:45 AND LEAVE AT 1:45 AND ALL GRADE 1-5 STUDENTS WILL BE DISMISSED AT 1:49PM. We will be hosting our Open House on Wednesday, April 11, 2018, from 5:30-7:00 pm. Please join us for an event that will showcase our STARS work in their classroom! There will be an AMAZING art gallery that will be open during the Open House. Our Stars have created works of art that are SWEET! Please join us in the MPR at our "SWEET SHOP" art show and gallery walk where you can "purchase" these great works of art for a donation to our art Docent Fund. Our Book Fair will also be open during the event. All proceeds from our book fairs are filtered back into our library and our classrooms! You can also shop online! We will conclude our evening coming together as a school community with ice cream sandwiches and popsicles. CAASPP UPDATE - Testing HAS BEGUN! Thomas Jefferson students in grades 3-5 will be taking the statewide achievement test (CAASPP) during the months of April and May. This test is given each year to gather data on the growth and achievement of our students in Language Arts, Math, and Science in grade 5. It is also a great opportunity to discover areas of strength and growth in our instructional practices school-wide. This year, all students will be testing in the morning and we will have grade levels testing on a staggered schedule throughout the month. Thank you for making sure your child is at school and on time each day and for encouraging them to do their best and show what they know! APRIL 15-19, 2019 SCHOOL WILL NOT BE IN SESSION. APRIL 22, 2019 IS A PROFESSIONAL DEVELOPMENT DAY AND THEIR WILL BE NO SCHOOL. The Roseville City School District is excited to announce new and returning student registration for the 2019-2020 school year began online on January 8th. Our online registration system is a secure and green process, which allows the Roseville City School District to verify all student demographics, emergency and medical information for your student before the start of the new school year. We encourage all families to take action and complete the online registration process as soon as possible. If you do not have access to technology, we can help! Just reach out to your student's school, and you can make an appointment to use a school computer to complete the process. Please check the District website at https://www.rcsdk8.org/student-registration for a link to register your student. If you have not registered for the next academic year please do so and if you have TK or Kindergarten student please register them as soon as possible. Our staffing is dependent on student registration. We have a VERY busy STAR-filled week ahead of us! We have StarStruck, Spring Pictures and, Awards Assemblies, not to mention a fire drill that will be thrown into the mix! Our Stars have been working very hard practicing their dances and are READY to perform! The dances have been created so that each Star shines and it is important that they stay for BOTH performances. We appreciate your flexibility! If you have not purchased tickets for this Star Studded Event ticket are available in the office during office hours, 7:30 am - 4:00 pm; TICKETS WILL NOT BE SOLD AT THE DOOR. STUDENT SAFETY: Please remember that the loop is for drop off and pick up. Please ensure that there is a fluid movement of traffic and that you are pulling up to the front if the loop to pick up your child. Please do not ask your child to walk to the end of the loop for pick up and then pull out to to the flow of traffic. This creates a safety issue with people who are crossing the parking lots. The staff has been instructed to hold students at the front of the loop for their safety and for the safety of pedestrians. Thank you for looking out for the safety of ALL of our Stars. Bike and Scooters: Please remind your Star that if they are riding their bike or scooter to school that they must wear a helmet and that they need to WALK their bike while on campus. Thank you for your collaboration and dedication to our TJ community! ART TO REMEMBER ORDERS ARE DUE TOMORROW, MONDAY, MARCH 25, 2019. Spring Picture Day is THIS Wednesday, March 27, 2019. This is a great way to capture how much your Star has grown this year! 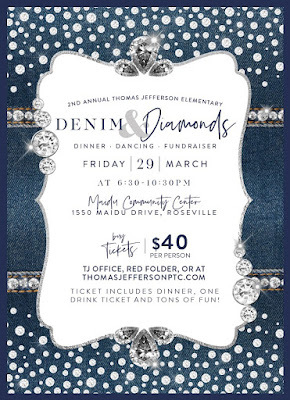 The Thomas Jefferson PTC is excited to announce that on Friday, March 29th our 2nd Annual Denim & Diamonds Dinner & Auction Party is back! This year’s event benefits our Thomas Jefferson Elementary Students and their campus; the evening’s proceeds will directly benefit Campus Beautification along with Recess & Playground Equipment needs. Ticket Sales are LIVE today on our new website; visit http://www.thomasjeffersonptc.com now to purchase your tickets! The tickets will be discounted until February 15th for $35/person, after the 15th the tickets are $40/person. Your ticket includes dinner, 1 drink ticket, dancing and so much more! While you are there buying your tickets for this fun adult evening please check out the Step & Repeat, raffle and basket winners and fun photos from last year’s event! Since the theme is Denim & Diamonds, wear your favorite jeans and add your best bling! The ticket order form can be found HERE. CAASPP Testing will begin on April 3, 2019, in grades 3-5. Please check with your child's teacher for specific testing days. It is important that students are on time to school, are well rested and have had a nutritious breakfast. For more information about CAASPP testing please see the RCSD information letter HERE. We are still selling tickets to our Starstruck Performances on Tuesday, March 26th at 6:00 PM or 7:00 PM and Thursday, March 28th at 6:00 or 7:00 PM. You may buy tickets in the office until Wednesday, March 20th. Please join the TJ PTC for dinner, community, on and fun at CHIPOLTE in the Nugget Plaza on Monday, March 18, 2019, from 4-8pm. Proceeds for the event will support enrichment activities at Thomas Jefferson.